What if you couldn't touch anything in the outside world? Never breathe in the fresh air, feel the sun warm your face…or kiss the boy next door? 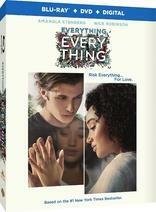 Everything, Everything tells the unlikely love story of Maddy, a smart, curious and imaginative 18-year-old who due to an illness cannot leave the protection of her home, and Olly, the cute boy next door who ignites her desire to escape safety and sacrifice everything for love.